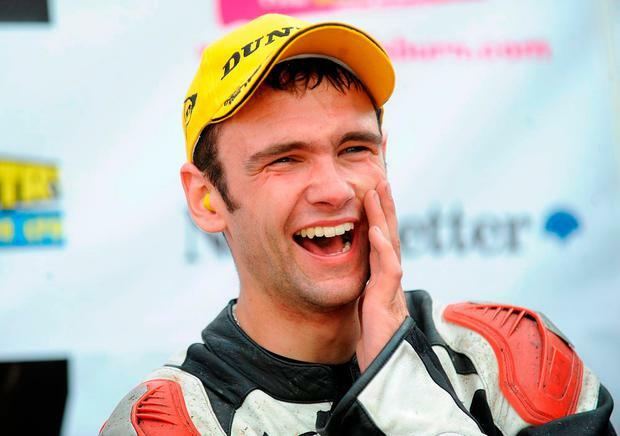 Thousands of mourners packed the quiet country road outside Garryduff Presbyterian Church to say goodbye to one of motor racing's most loved sons - William Dunlop. They lined the route to the church from the Dunlop family home in Ballymoney, Co Antrim, to pay their final respects to the man who they had followed on the race track for many years. He was to celebrate his daughter Ella's birthday on Sunday and his own birthday this week. Yesterday bikers stood silently with their heads bowed against the driving rain as the coffin slowly moved towards the church where William's father Robert, killed at the North West 200 in 2008, and his uncle Joey, who died while racing in Estonia eight years earlier, were also remembered. The mourners were led by William's heartbroken pregnant partner Janine - due to have the couple's second child in October - and his mother Louise. "Many wonderful tributes have already been paid to William," he said. "No one tribute or indeed all together will suffice, there are as many stories and memories as there are people here, as we share them and treasure them, we celebrate the full and meaningful life William lived, and we enable his story to be told." Bikers from all over Ireland rode to Ballymoney to pay their respects to the man they called "a hero and an inspiration". Many of the bike fans stopped at the Dunlop Memorial Gardens in nearby Ballymoney on their way home from the funeral.